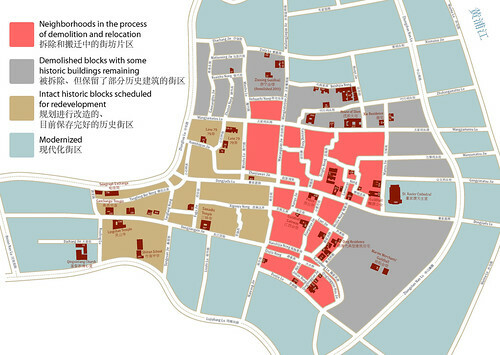 Dongjiadu: Threatened Architecture Map, a photo by avezink on Flickr. Dongjiadu 董家渡 – the old docks – is arguably the most important historic district in Shanghai. It was the economic center of the city centuries before the Europeans built their treaty port. Located between the old city walls and the Huangpu River, Dongjiadu was a trade terminal for the entire Yangtze delta – and it was the business center of a thriving multi-ethnic commercial capital. Merchants and transport tycoons from Fujian, Guangdong and Zhejiang built up the area and created an intricate network of shipyards, workshops, residences and guildhalls. The fantastic range of architecture, business enterprise and ethnicities had never been seen before; diversity made Shanghai unique among Chinese cities. Neglect, vandalism and poverty in the twentieth century corroded the neighborhood, but the urban fabric and many historic buildings remained intact. It was in the last decade, that most of street network and heritage architecture has been destroyed. Shanghai’s oldest shikumen blocks at Doushi Jie were replaced by high-rises. Wood-and-brick lane compounds that used to line Caocang Jie, Luxi Jie, Zhuhangmatou Jie are gone. Qing-era courtyards on Qinglongqiao Jie and Laiyimatou Jie have disappeared beneath a parking lot. Republican school buildings that faced the Dongjiadu Church were razed in 2010. Pre-war warehouses and Japanese-built factories that lined Waima Lu and the perpendicular wharf streets are replaced with strip malls. Spectacular ethnic guild halls have been disassembled and rebuilt, or simply torn down. In the last year, the demolition and eviction process has accelerated. The destruction of authentic neighborhoods is erasing Shanghai’s original character. This loss is especially acute in an area that was so unique and so central. Living history remains on a few streets in the old docks. Over fifty buildings of documented historical value are still standing. Only one is protected by the government. The following is a list of heritage sites that still could be preserved.